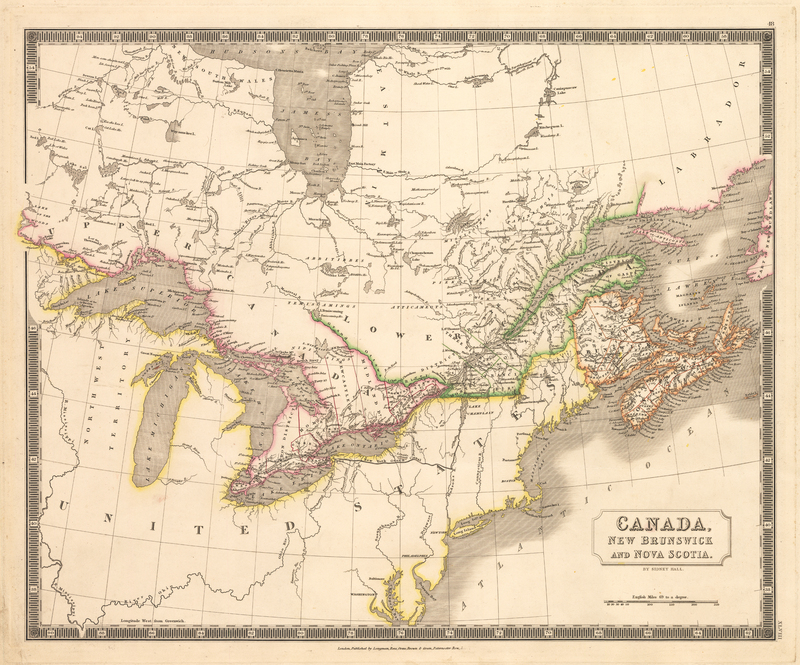 This beautiful map of Canada and the Great Lakes by Sidney Hall covers Upper Canada (Ontario), Lower Canada (Quebec), Nova Scotia, New Brunswick and Prince Edward Island along with part of adjacent Newfoundland. It is done in meticulous detail in the places named in the title cartouche. It includes all five of the Great Lakes and delineates the New York Grand Canal (the Erie Canal). Towns, rivers, mountains, railroads, canals, marshes, forests, and various other important topographical details are noted. Elevation throughout is rendered by hachure and political and territorial boundaries are outlined in color. The map is surrounded by an attractive keyboard border. Condition: This map with original color is in A- condition. Toning is light and even. One minor smudge in image.